The SAARC ministerial meeting today gave its stamp of approval to India’s stand on the WTO in its joint declaration which stresses on resolution of implementation concerns upfront and greater market access by developed countries. A murder case was registered against the SHO of Baleni village in Baghpat district of UP where two villagers were killed in police firing yesterday. 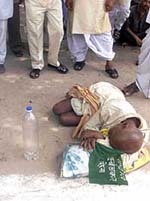 Union Home Minister L.K. Advani today stated that all madarsas across the country should not be blamed for fundamentalist activities, though he agreed that a spurt in the number of madarsas, especially in the border areas was indeed a cause for concern. The Congress today demanded a probe into the manner in which unabridged videotapes made available to the Venkataswami Commission by Tehelka reached the media. The debate on disinvestment in the Lok Sabha today produced a drama of sorts when Congress member P. R. Dasmunsi quoted from a letter purportedly written by Cabinet Secretary opposing Air India divestment but retracted soon when confronted by government terming the document as “forged” and announcing a CBI probe into it. The Food Corporation of India has reported a storage loss of 49,959 metric tonnes of wheat in Punjab during 1999-2000, the Minister of State for Consumer Affairs, Food and Public Distribution, Mr Sriram Chauhan, informed the Rajya Sabha in a written reply today. Indian sculptor Amar Nath Ghosh gives finishing touches to an idol of the Hindu goddess Durga in Calcutta on Friday. 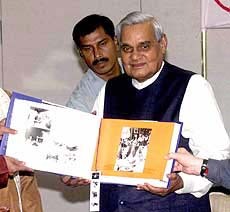 Prime Minister Atal Behari Vajpayee holding “Jananayak,” a pictorial biography on himself, after it was presented by its publisher in New Delhi on Thursday. 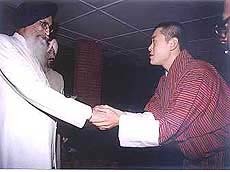 Uttranchal Governor Surjit Singh Barnala with Crown Prince of Bhutan, Dashon Zigme Khesar Namgyel, in Dehra Dun on Wednesday. The release of former test cricketer Manoj Prabhakar, who was granted bail on July 17 by the Uttaranchal High Court in the chit fund case, has run into trouble after one of the sureties withdrew, the police said here today. The CBI today filed an FIR against a dismissed Air Force officer, a Flight Lieutenant and two private companies on charges of conspiring to cause a loss of Rs 26 lakh to the public exchequer. In the absence of any relief from the Supreme Court regarding its September 30 deadline for conversion of all vehicles to the CNG mode, the operators of autorickshaws, taxis and buses have decided to go on a one-day strike on August 28. Patients had a harrowing time as the work remained paralysed for the second day today in the capital’s premier hospital All-India Institute of Medical Sciences (AIIMS) following a strike by resident doctors over an altercation between a junior doctor and a worker. National Secretary of the Rashtriya Lok Dal (RLD) Shahnwaz Kadri today resigned from the party to protest against party President Ajit Singh’s decision to join the BJP-led National Democratic Alliance government at the Centre. Bablu alias, Nazam Ali, wanted in about 24 criminal cases by the Haryana, Punjab, Uttar Pradesh, Rajasthan and Delhi police was killed here yesterday in an encounter with the police. Congress President Sonia Gandhi has approved new office-bearers of the All-India Mahila Congress and also cleared the list of the reconstituted Karnataka PCC. A renowned Punjabi litterateur and recipient of many coveted awards, Mr Lochan Singh Buxi, died in the Capital today. He suffered a heart attack in the early hours. He was 78. The 15-point joint statement issued at the end of a two-day meeting to evolve a common front on WTO issues, reiterated India’s stand that implementation issues, which were a fallout of the Uruguay round, should be resolved upfront without any extraneous linkages. The declaration also called for increased market access opportunities to be provided by the developed countries to facilitate industrialisation in developing countries by eliminating trade distorting subsidies, non-tariff barriers and unreasonable protectionist measures. The statement expressed disappointment “on the lack of any meaningful progress, despite a clear decision in May, 2000, by the WTO General Council that these issues have to be addressed and decisions taken for appropriate action not later than the Fourth WTO Ministerial Conference. “Any further delay was likely to erode the credibility of the multilateral trading system among the developing and the least developing countries,” it said. In agriculture, SAARC ministers emphasised the need for substantial reductions in tariffs and tariff escalations, reduction in domestic support and elimination of all forms of export subsidies given by developed countries to facilitate greater market access for agricultural products of the developing countries. The statement also called for a moratorium on anti- dumping, anti-subsidy and safeguard measures, resorted to by importing countries on exports from developing and least developing countries until January 7, 2007. The statement voiced concern that Uruguay Round of Agreements and their implementation had further accentuated inequalities and disparities between the developed and the developing countries. It said relevant provisions of the TRIPS agreement relating to meaningful transfer and dissemination of technology by the developed to the developing countries should be effectively operationalised. “Greater flexibility and clarity were also required so as to ensure affordable access to essential medicines and life saving drugs in keeping with public health concerns of the developing countries,” it said, adding that “nothing in the TRIPS agreement should prevent governments from taking measures for protecting public health”. The police said SHO Satish Kumar Rai and two constables were suspended from service and the Baghpat SP was transferred for the firing incident, which occurred while the political climate heats up ahead of the crucial Assembly elections in UP. DIG Arun Kumar said that the situation in the village was tense but under control. He said the police had asked the villagers to make a list of those missing after the incident so that a search could be launched for them. 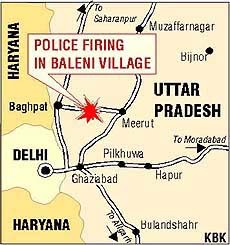 Baleni residents claim five persons died, but the police maintains only two were killed in the firing, which happened after a siege of the station over the demand for release of a few arrested villagers. A high-level inquiry committee of the Samajwadi Party (SP), after touring the village, demanded today that a murder case be registered also against the district SP. The main opposition party in the state said all guilty police personnel should be sent to jail. Rajya Sabha MP Shivpal Yadav, who led the committee, claimed while talking to reporters that 10 persons were killed in the firing. SP President Mulayam Singh Yadav will attend the condolence meeting to be held on August 27 in Baleni village, Mr Shivpal Yadav said. He also demanded a judicial inquiry into the matter. While interacting with members of the Parliamentary Consultative Committee attached to his Ministry, Mr Advani promised that the government would look into the sudden mushrooming of these madarsas. He also stated that the Centre would be consulting the West Bengal government on the sprouting of madarsas in border areas, particularly along the Indo-Nepal border. The Home Minister agreed with the averments of some members that teachings of these schools should be modernised in keeping with the modern times. Mr Advani told the Committee that while countering Pakistan ISI’s proxy war against India, 101 ISI-backed modules were busted across the country during 1998-2001. While busting these modules, 19 terrorists, including six Pakistanis, were killed and 321 arrested. The Congress today demanded a probe into the manner in which unabridged videotapes made available to the Venkataswami Commission by Tehelka reached the media. It also took exception to the manner in which Parliamentary Affairs Minister Pramod Mahajan “tried to give a clean chit” to former Defence Minister George Fernandes when the charges regarding the Tehelka expose were being scrutinised by the judicial commission. Congress chief spokesperson Jaipal Reddy said the party was not against investigative journalism and the media had the right to information. He said Tehelka had apparently given only one copy of the transcripts and tapes to the Venkataswami Commission, a copy of which was subsequently forwarded to the Defence Ministry. “Who is responsible for the supply of videotapes?” Mr Reddy asked. He said somebody in the Defence Ministry must take responsibility for the leakage because the commission, on its own, had denied responsibility for the leakage. Referring to Mr Mahajan’s statement today in which the minister said the Home Ministry would examine if a case existed against Tehelka for using certain methods to nab the guilty, Mr Reddy asked why it was still unclear whether there was a case against Tehelka or not. He said Mr Mahajan had tried to give a clean chit to Mr Fernandes apparently to silence rumblings in the NDA or prejudice decision by the judicial commission. Accusing the government of double standards, Mr Reddy said there were “open and shut” cases against former BJP President Bangaru Laxman, former Samata Party chief Jaya Jaitley and Samata Party functionaries including Mr R.K. Jain, but no cases had yet been registered. While the Tehelka controversy had been raging for the past six months, the government had never said it would examine if a case could be made against the BJP or Samata Party leaders. “The government seems to be following one standard for these leaders and another for Tehelka,” Mr Reddy said. Assam PWD Minister Sarat Barakataky has slapped a legal notice on news portal Tehelka.com for allegedly framing him in the “bigamy scandal’’ involving former Chief Minister Prafulla Kumar Mahanta. Mr Barkotoky told UNI today that if the notice was not returned within 10 days, he would file a Rs 5 crore defamation case against the portal, which had accused him of bribing Ms Sanghamitra Bharali, the woman whom Mahanta, allegedly married in Mumbai, to speak out. The minister alleged that Tehelka.com was used by Mr Mahanta to escape the bigamy charge, as he was facing a serious revolt from within the party over the issue. Claiming innocence, Mr Barkotoky has vowed to teach the portal a lesson. The bigamy charge saw acrimonious scenes at the AGP executive meeting, which had a day-long discussion on the subject. Mr Mahanta faced some embarrassing moments there, but the meeting eventually termed the “bigamy scandal” a conspiracy. Speaker G.M.C. Balayogi today tried to discipline a member of the House when he asked Samata Party MP Prabhu Nath Singh to leave the House for his persistent effort to disrupt the question hour by raising the Tehelka issue. While the Speaker has been trying his best to conduct the proceedings of the House in a disciplined manner for the past few months, Mr Balayogi had to take the step as Mr Singh refused to resume his seat for almost 10 minutes despite innumerous observations from the Chair. At last when his repeated pleas with the member fell on deaf ears, an exasperated Balayogi then asked Mr Prabhu Nath Singh to leave the House or sit quietly and raise whatever he wanted during the zero hour. The action came close on the heels of an all-party meeting convened by the Speaker to discuss the unruly behaviour of members of the House particularly a incident of yesterday when Treasury Bench members led by Samata Party MPs came into the well of the House on Tehelka issue leading to the adjournment of the Lok Sabha till 2 p.m. The meeting today morning decided that members who enter the well of the House and create disorder would invite automatic suspension for a week. Participating in the discussion, Mr Dasmunsi opposed disinvestment in Air India on the ground of national interest and lack of transparency and quoted the letter purportedly written by the Cabinet Secretary to the Prime Minister to substantiate his argument. The Food Corporation of India (FCI) has reported a storage loss of 49,959 metric tonnes of wheat in Punjab during 1999-2000, the Minister of State for Consumer Affairs, Food and Public Distribution, Mr Sriram Chauhan, informed the Rajya Sabha in a written reply today. In Haryana, a storage loss of 730 metric tonnes of wheat was reported during the period, the minister further informed. In reply to another question, the minister said various measures had been taken by the government to reduce losses, including the adoption of 50 kg packaging in a phased manner and improvement in size and quality of gunny bags. The quantum of food-grain losses during the post-harvest period at the farm level due to insects, rodents, moisture, birds and micro-organisms in Punjab and Haryana is not known, Mr Chauhan informed the Upper House today in a written reply. A committee headed by Dr V.G. Panse, in its report, had estimated annual post-harvest food-grain losses in various stages at 9.33 per cent, Mr Chauhan further informed the House. An estimated 8,716,000 tonnes of basmati rice has been produced in Punjab during 1999-2000, the Minister for Agriculture, Mr Ajit Singh informed the Lok Sabha today. In Haryana, 2,594,000 tonnes of basmati rice was produced while in Himachal Pradesh, 120,400 tonnes was produced. The corresponding figure in Jammu and Kashmir stood at 391,100 tonnes, the minister informed. Software exports from Haryana, through the Software Technology Parks of India (STPI), during 2000-01, stood at Rs 1,450 crore, the Minister for Parliamentary Affairs and Information Technology, Mr Pramod Mahajan, told the Rajya Sabha in a written reply today. Software export from Punjab through STPI during the same period stood at Rs 50 crore. Preetpal, in an application before the Chief Judicial Magistrate, Nainital, yesterday pleaded he was withdrawing his surety for Prabhakar as he was unable to furnish a bond of Rs 50,000, police said. Preetpal, who hails from the Haldwani area of Nainital district, pleaded before the court that he had agreed to give surety to Prabhakar in the bail plea only at the behest of his relatives and he did not know Prabhakar personally. Prabhakar, admitted to a private nursing home in Haldwani following a suspected brain stroke, is recuperating in a hospital, doctors said. Mr Kadri claimed that there was resentment in the RLD over Ajit Singh’s decision to join the NDA and said many of the party legislators were also planning to leave the party. Bablu alias, Nazam Ali, wanted in about 24 criminal cases by the Haryana, Punjab, Uttar Pradesh, Rajasthan and Delhi police was killed here yesterday in an encounter with the police. A jeep, some papers, cash and weapons were seized. The police has arrested, Manu Aggarwal, an accomplice of Bablu for investigations. According to the police an informer gave a tip off about Bablu’s presence in the Dhani of Jai Mohammad near Hanshia village under the Goluwala police station. On getting the information, SHO, Pilibangan, Mr Ram Niwas accompanied by a police party reached there. Bablu opened firing at the police party. The police asked Bablu to surrender, but when he continued firing the police returned the fire. On this, Bablu tried to escape and entered the fields where he was shot dead. The police recovered some cartridges a Pakistan-made pistol and a suitcase with Rs 18,000 It also impounded the jeep in which Bablu had come. Police sources said, Bablu was a history-sheeter and was among the list of top 10 criminals of Rajasthan. About 24 cases of murder, looting and dacoity were registered against him at places in Rajasthan and the surrounding states of Uttar Pradesh, Haryana, Punjab and Delhi. According to the police documents found from the site of the encounter revealed Bablu’s association with militants of Jammu and Kashmir. According to the Mahila Congress chief Mrs Chandresh Kumari, MP, five new Mahila Congress state presidents have also been appointed. The newly appointed state presidents of the Mahila Congress are Ms Shanta Singh for Andaman and Nicobar, Ms Nagamma Keshavmurthy for Karnataka, Ms Manorama Sharma for Uttaranchal, Ms Usha Sinha for Bihar and Ms Saraswati Hembram for Orissa. In Karnataka, while Mr Allum Veerabhadrappa would be the PCC chief, Mr Shamnur Shivashankarappa has been made the treasurer. Mr Buxi, who retired as Station Director from All India Radio in 1981, took to the promotion of Punjabi art and culture. He authored several books and won prestigious awards like the Best litterateur Award of the Punjabi Academy. He was also honoured by the Academy of Art and culture, Government of Jammu and Kashmir. The bhog ceremony will be held in Gurdwara Akali Baba Phula Singh on August 26 in the Capital’s Old Rajinder Nagar.